Photo: Courtesy of Surrey Nanosystems. Friends, the day has come that we can retire our "I'll Stop Wearing Black When They Make a Darker Color" T-shirts. According to The Independent, British company Surrey NanoSystems "has produced a 'strange, alien' material so black that it absorbs all but 0.035 [%] of visual light, setting a new world record." 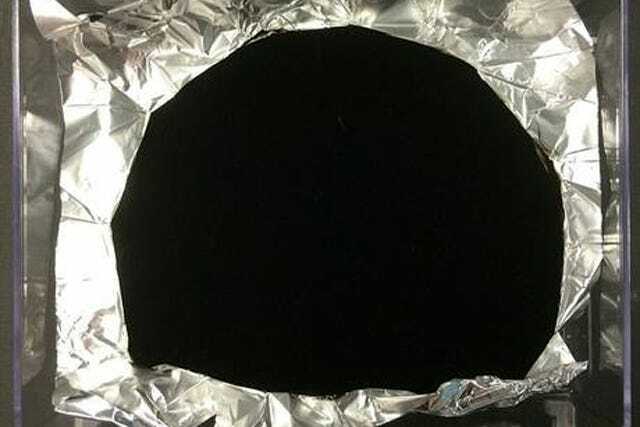 Called Vantablack, the substance groups together a set of nanotubes ("like incredibly thin drinking straws"). It helps calibrate the cameras and telescopes astronomers use to photograph and study the universe's eldest entities.